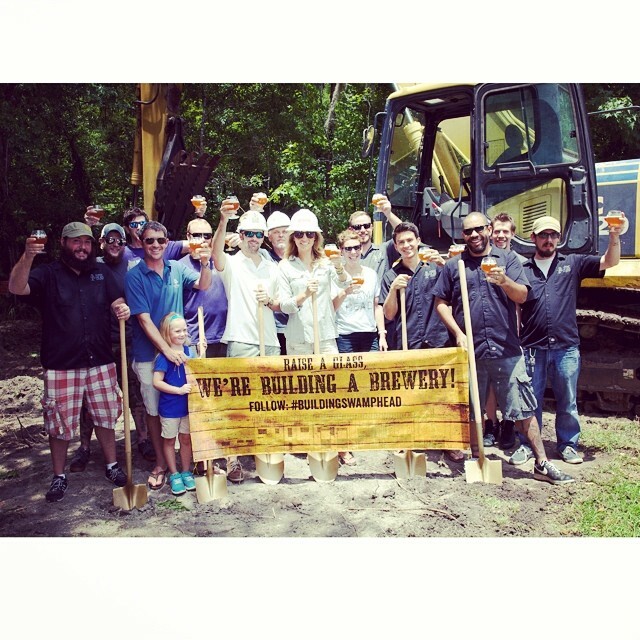 Gainesville, FL • July 11th, 2014 — Swamp Head has broken ground on their new 13,000 sq. ft. facility that will be located at 3650 SW 42nd Ave, Gainesville, FL. Scherer Construction of Gainesville is managing the ground up design/build project. With the expansion, Swamp Head will be able to more than triple its beer production, allowing for more packaged product, including cans. A new four-vessel 30-barrel (930 gallons) brew system and all associated tanks are currently being constructed in Oregon and will be installed at the new location. The new equipment will triple the size of each of Swamp Head’s brews on their current two-vessel 10-barrel (310 gallon) brew system. All of Swamp Head’s tanks and brew system will be sourced in the U.S.A. The new tasting room, “The Wetlands,” will grow in size and have significant improvements from the current location, featuring a larger bar, more taps, more bathrooms, outside seating and a growler filling station separate from the main bar. Swamp Head will continue operation at its current location at 3140 SW 42nd Way until the new facility is complete; announcements will be made when the new location is open for business. Earlier this year, Swamp Head was awarded a gold at the World Beer Cup in the Smoke Beer style category for Smoke Signal, a robust smoked porter that uses alder wood smoked malt to obtain a soft, smoky flavor. The World Beer Cup is considered “The Olympics of Beer” and is a global beer competition that evaluates beers from around the world and recognizes the most outstanding brewers and their beers. Swamp Head Brewery was founded in 2008 in Gainesville, FL and has been striving to follow their mission of brewing world-class beer and establishing themselves as Florida’s Brewery. In 2009, Swamp Head started selling Wild Night Honey Cream Ale, Cottonmouth Belgian Witbier, Stump Knocker Pale Ale, Midnight Oil Oatmeal Coffee Stout and Big Nose IPA. These five beers remain as their year round portfolio today. Please direct any questions or media inquiries to Brandon Nappy at Brandon@swamphead.com.